We’ve been chewing this over in our Worship Planning group and in our Team meetings, and as a result we’re starting something new this week after the service – and refreshing something old before the service. Before the service, things can get pretty busy in the hall area (‘narthex’ in church jargon) that we currently use for worship. We love the welcoming bustle and hum of chat, but we also know that some people value a time of quiet contemplation before worship. When we get the main worship space up and running, we’ll be able to have a distinction between a quiet, prayerful space and a welcome and conversation space. In the meantime, we’ve cleared and refreshed the Prayer Room (on the immediate right just inside the main church space), and all those who would value a bit more quiet before the service – or indeed at any point in the service – is invited to make use of that. After the service, while we have our refreshments, we are introducing two new tables, at the opposite end of the room to the coffee bar. One will be the Quiet Table, and that is for anyone to sit at who would rather drink their tea or coffee in silence – rather like you do on retreat – rather than engage in conversation. Please respect the choice of anyone who sits here – we could be here for any number of reasons (such as feeling ‘peopled out’; prayerfully reflecting on the service; found something particularly emotional and need some down time to process it; or just enjoying a moment of calm). The other new table will be the Theme Table. One of the distinctive features of worship at St Brides is that we prioritise discussion and conversation around the theme, readings or talk. Often, the ‘sermon slot’ consists of a short discussion starter and then conversation or discussion; sometimes, there is more substantial input and then the aim is to have discussion afterwards. But we have found that in refreshments there is often so much conversation that the opportunity to specifically take the discussion on the theme forward is lost, or those who want to do so can’t find the others who want to join them in the throng! 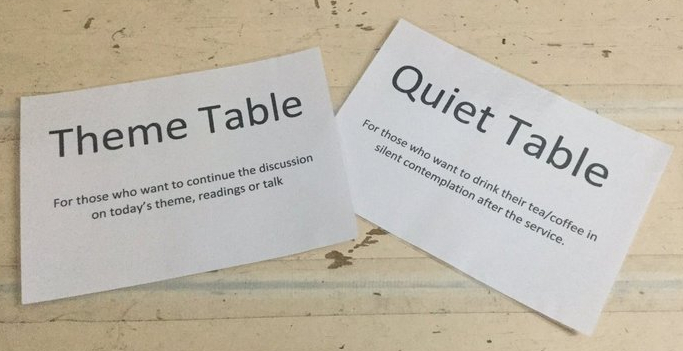 So this is a dedicated table for those who particularly wish not to engage in general conversation after the service, but to continue or begin a discussion on the theme, readings or talk. We encourage the speaker to join this table. Many people will continue to enjoy the community meeting and mingling more generally, and we hope that you will feel free to move between the three spaces, as feels right to you, from week to week or within one morning. Let us know how it feels!